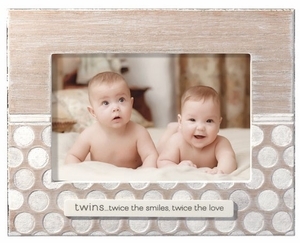 A special way to showcase the precious twins in your life! From the Born in Grace Collection from Grasslands Road, this Twice the Smiles, Twice the Love twin frame is designed in neutral colors, perfect for any gender twins. The frame holds a 4x6 photo and is made of natural wood. A beautiful addition to any nursery and a unique gift for a twin baby shower or family member of twins! Measures 6 3/4" x 8 1/2".